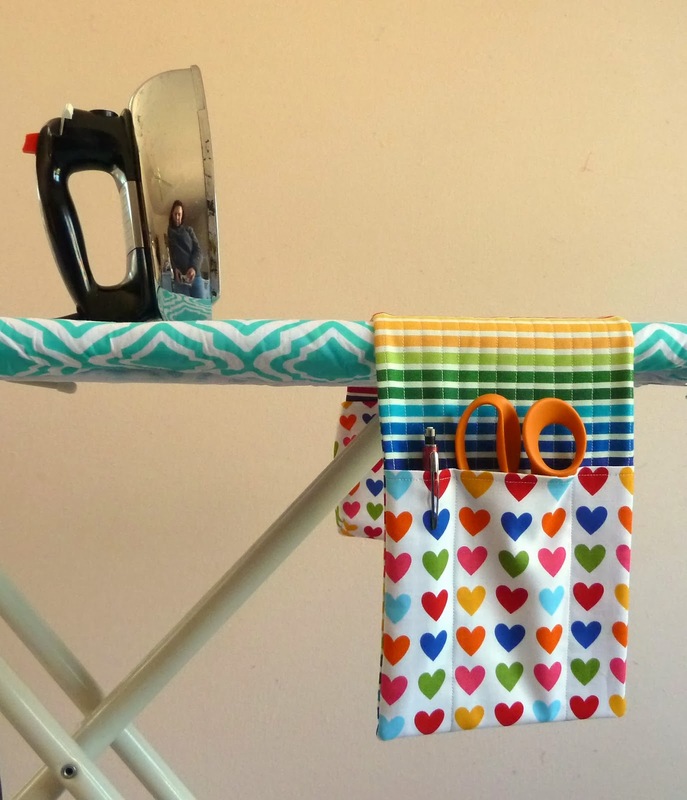 Do you love your iron? I've been using a Black & Decker Classic since my Rowenta had a melt-down. I like it because it's heavy which is ideal for pressing but the steam holes are too big and tend to catch on small pieces which drives me nuts! 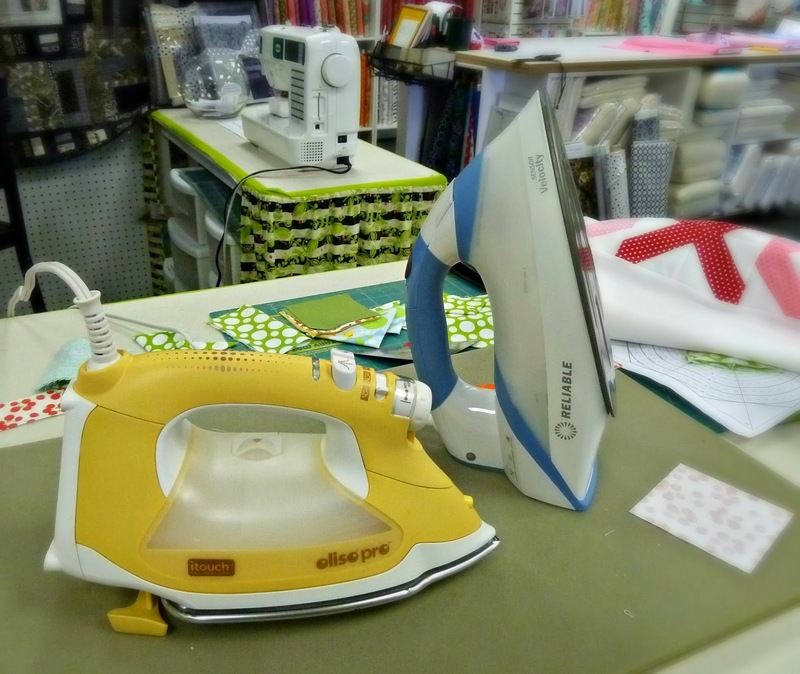 This month Quilter's Way is offering an Iron Throw Down. You can stop by anytime before Friday, February 14th to test the Oliso TG1600 ProSmart and the Reliable V200 Sensor Velocity. Vote for your favorite and save 20%. Today I went in for a test drive with my wrinkled table runner that spent the weekend crumpled up in my tote bag. Both irons did a great job getting the creases out and both have small steam holes which didn't catch when I tried pressing some small pieced blocks. 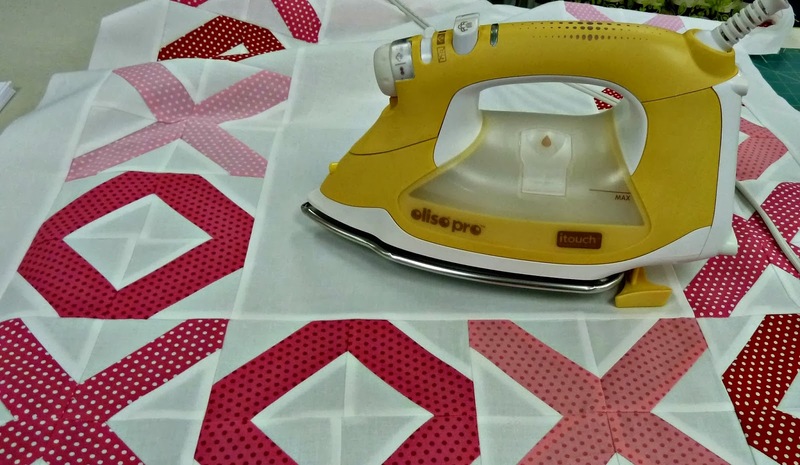 The Oliso has taken the quilting world by storm with it's pop up design. I've tried them here and at the Philly Sew Down and just haven't felt the love but everyone tells me it just takes getting used to. I also liked the Reliable but found the steam buttons to be too low on the handle so every time I picked it up I accidentally got a blast of steam. I'm still on the fence which I prefer but have until Friday to decide... What's your favorite iron? I have a cheap Back and Decker I picked up from Big Lots about a year ago. I don't use the steam in it though - the engineer in me is leery of putting water inside anything with a plug. So I use a spray bottle for water. It's working great and for $15, I'm ok if it dies after a year. I've had "nice" irons before, but they only lasted 2-3 years. I guess I'm too frugal (or cheap) to spend a lot on something that I know won't last a long time. I had to replace my 30+ year old GE iron and bought a Rowenta, not happy. I think my next will be the Black and Decker Digital, everyone seems to really like it. I'm always reading everything anyone has to say about irons, you'd think it would be easy. I LOVE my Oliso. I've had mine for more than three years and it's still going strong. If it ever gives out, I'm totally getting another Oliso. The only thing is that I need to be careful when I use other irons because I'm so used to leaving the iron in the down position. That's why I bring my Oliso to retreat with me, so I don't burn the place down. Hi! I bought a Reliable Iron $169 on Amazon and had it for 6 months and it literally quite working! Talk about disappointment. I sent it to Reliable in Canada ($17 postage) and they fixed it and sent it back within a month. I had always had Rowenta, but my last one leaked alot. So I switched to Reliable after reading so many excellent things on quilting blogs about them. I have to have an iron - so my hubby said, lets go back to Rowenta. We did - and I purchased one for $89. I READ the instructions (I'm bad doing this always) and it says to never leave water in your Rowenta. Always dump it out after use. I never did that - so that is why it started leaking. I love my Rowenta and I have just shoved my Reliable back in the closet for use if I ever need it. I am so happy to have a good Rowenta again. The Reliable was good while it worked - it was just a bit clumsy - very big feeling.